Here at The Adventure Junkies, we want to help you get the most out of your liveaboard trip to Cocos Island. We’ve put together this handy guide to help you plan your vacation and find the best boat for your needs. Cocos is not a budget destination. But, travelers looking to save money will find the region’s most competitive pricing onboard the Okeanos Aggressor. Shared cabins help keep costs low, but this boat doesn’t feel like a discount operator. And, you can expect plenty of perks, just like the rest of the legendary Aggressor Fleet. Free beer and wine, spacious sun decks, and fine dining make it easy to unwind after a long day in the water. 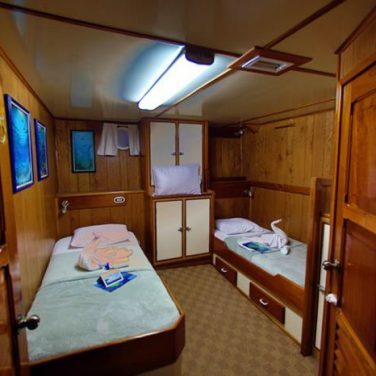 But, this liveaboard isn’t focused only on creature comforts. A massive dive deck, modern camera facilities, Nitrox, and PADI specialty courses balance the experience. Underwater photographers have plenty of options in Cocos. 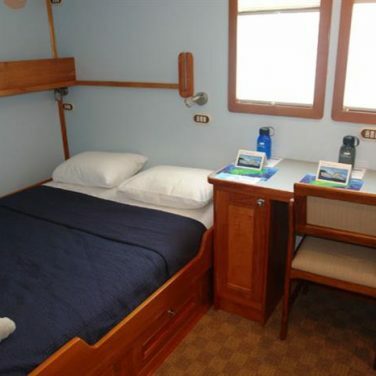 But, this liveaboard takes its photo facilities to the next level. The dive deck is outfitted with individual storage cubbies, dedicated rinse bins, and a multi level table with blow dryer. An indoor photo development room makes it easy to review and edit your best shots from each day. And, cabins come equipped with extra charging points, perfect for guests with multiple cameras. 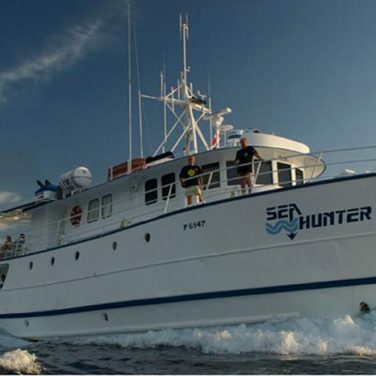 The Sea Hunter also offers Nitrox and technical gasses for experienced divers. So, if you’re looking to go deeper or stay down longer, this boat is your best bet. 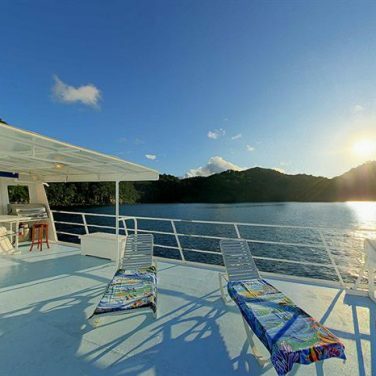 This is the most luxurious liveaboard in Cocos, and it holds the smallest number of guests. 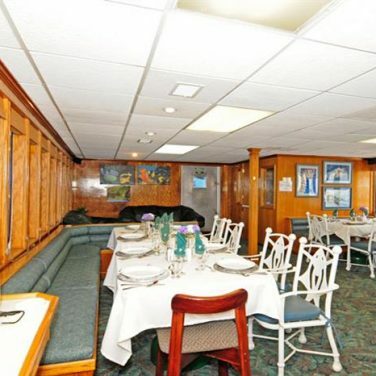 So, you can expect plenty of creature comforts and outstanding service above and below water. Plus, a variety of cabin upgrades make it easy to customize your experience. Dedicated divers will appreciate perks like free Nitrox, support for tech and rebreathers, modern camera stations, and some of the region’s best equipment facilities. 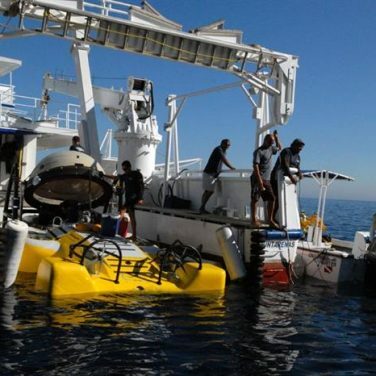 This boat also offers unique underwater excursions in its deep-sea submersible craft. Adventurous guests can explore depths up to 1,000 feet (305 meters) in a single immersion. Advanced. 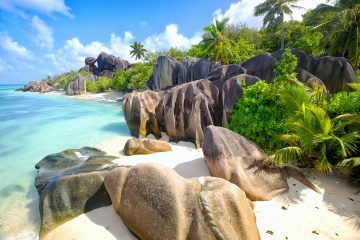 Cocos Island is one of the wildest places in the world. Located 36 hours off the coast, this region is the definition of remote. And, it’s no place for newbies. Divers can expect open ocean conditions, chop, surge, and battering Pacific currents. 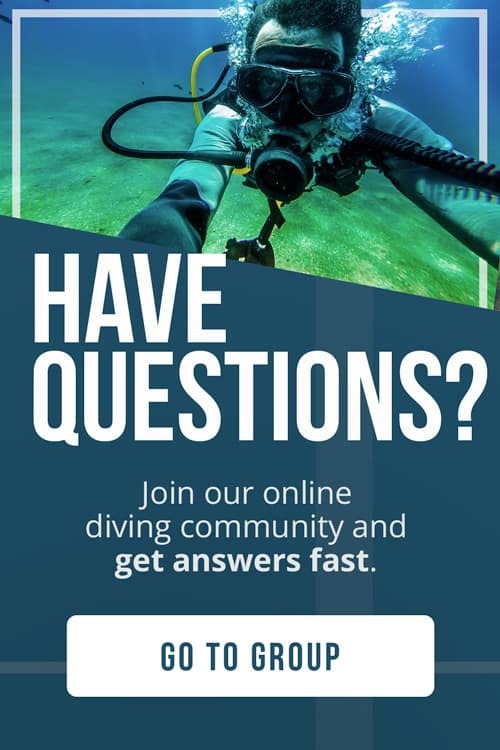 So, you should have an advanced certification, drift diving experience, and 50 logged dives before planning a trip here. 8 to 12 days. It takes a day and a half to reach Cocos Island by boat. 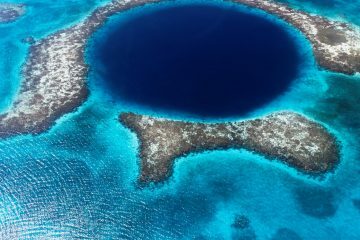 So, there’s no such thing as a quick trip to this far-flung dive destination. And, a classic 11 day itinerary translates to just 7 full days of diving. So, the longer your trip, the better. There’s no such thing as too much time in this exciting region! Cocos is a year-round dive destination with two distinct seasons. From December to May, you can expect calm seas and excellent visibility. However, divers in the know prefer to visit during the rainy season between June and December. Seas are rough, and blooming plankton reduces the visibility. But, these are the best months for spotting whale sharks, hammerheads, and manta rays. Like other destinations in the North Pacific, the weather around Cocos Island is a constantly changing mix of mist, rain, and tropical heat. You can expect water temperatures between 75 and 86° F (24 and 30° C). But, this region is home to cold currents and upwellings. So, you should pack at least a 3mm full suit to keep warm. Visibility in Cocos ranges from 39 to 98 feet (12 to 30 meters) depending on the dive site and season. You can expect reduced water clarity during the rainy season thanks to nutrient-rich upwellings and massive blooms of plankton. But, these conditions also attract the region’s most famous residents, sharks and rays. June and July are favorite months for underwater photographers. Welcome to the realm of sharks. Cocos Island remains one of the wildest places to dive in the North Pacific, and a haven for large pelagics. It takes a day and a half by boat to get there, but those who make the trip will be rewarded. Fast-paced drifts and schooling hammerheads by the hundreds await. Diving in these remote waters isn’t for beginners. The region’s Powerful Pacific currents and challenging surface conditions are best left for those with experience. Diving in Cocos is a little bit different. There are no quick trips to this far-flung destination. And, there is no easy diving once you get there. Most sites require advanced techniques like a negative descent. And, you can expect strong currents during every immersion. But, it’s all worthwhile. 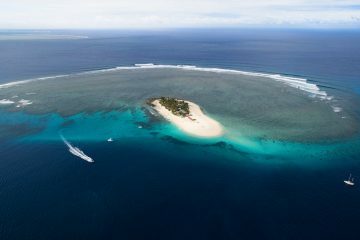 Lucky dive groups will encounter schooling sharks, manta rays, whale sharks, and massive shoals of jacks and trevallies. Don’t expect to see colorful corals while diving at Cocos. The island’s underwater landscape is made of volcanic rock. You will dive boulder fields, pinnacles, seamounts, and walls with some scattered traces of reef. Photographers should plan for wide angle and video if possible. And, be sure to pack plenty of batteries and spare parts. There are no camera shops where you’re going. As the rainy season begins, plankton around Cocos starts to bloom. And, it is this moveable feast that attracts whale sharks in from the open ocean to feed. Keep in mind that you are most likely to encounter these gentle giants in very shallow water. So, you should watch out during your ascents, descents, safety stops, and surface intervals. Between July and November, manta rays congregate around Cocos Island to feed on blooming plankton. And, if you plan a visit during these months, you’re likely to spot them at the region’s cleaning stations, too. No matter when you visit, keep an eye out for the rays’ silhouettes during your dives. These graceful filter feeders often glide silently above unsuspecting dive groups. Cocos is one of the best places on the planet for divers hoping to encounter hammerhead sharks. During the rainy season, the sharks gather here in massive schools, sometimes numbering in the hundreds. And, thanks to cool upwellings, they often venture into shallow water. Don’t forget to watch out in the blue, as these sharks tend to keep their distance. Cocos Island is famous for its huge resident population of hammerhead sharks. But, plenty of other species gather here, too. Dives just before dusk reveal large groups of whitetips scouring the rocks in search of an easy meal. And, trips during the rainy season are best for schooling Galapagos and silky sharks, sometimes in groups of 100 or more. If you’re hoping to catch a ride in the powerful currents of the North Pacific, Cocos won’t disappoint. This destination is famous for its fast-paced drifts. And, as most experienced divers know, strong currents attract big fish. If you’re planning a trip in this region, you should already have plenty of experience with drift diving. Cocos is one of the most remote diving destinations in the world. So, the more time you have there, the better. Simply put, there are no quick trips to this isolated region. You’ll need at least a full day of air travel to reach Costa Rica. Then, there’s a 30 hour boat ride from the coast. But, we promise it’s worth it! 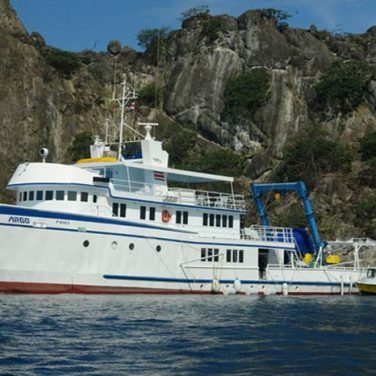 Liveaboard diving in this area is among the best in the North Pacific. You can expect to see large pelagics like sharks and mantas on every single dive. And, hardly another dive boat in sight. 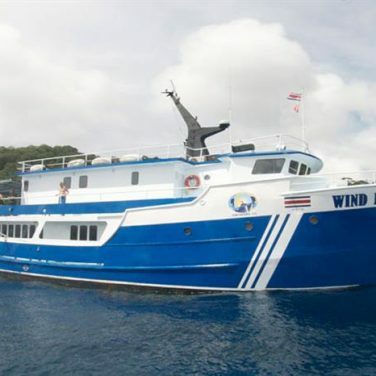 Thanks to strict government regulation, very few liveaboards visit Cocos Island. And, those that do follow strict itineraries controlled by the marine park. 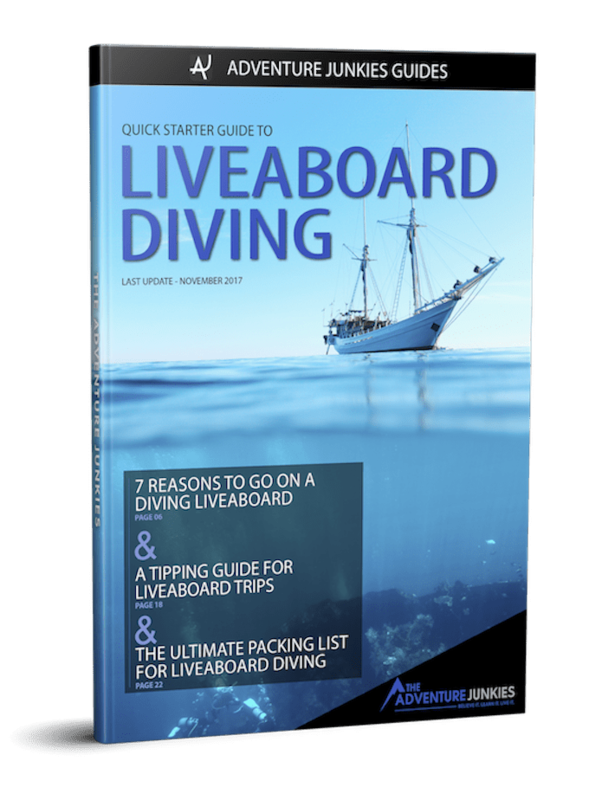 This set schedule means that you’ll never see a crowded dive site, or compete with other boats for mooring. But, it also leaves little room for diversity when it comes to the area’s different voyages. While dive site choices might vary slightly, every liveaboard in Cocos follows the same route and stays for the same amount of time. So, it’s best to choose your boat based on its amenities. If you’re hoping to dive with sharks, this area should be at the top of your list. Manuelita is a submerged mountain, home to multiple dive sites ranging from a steep vertical wall to the region’s only real coral reef. And, massive cleaning stations make it a hotspot for large pelagics. 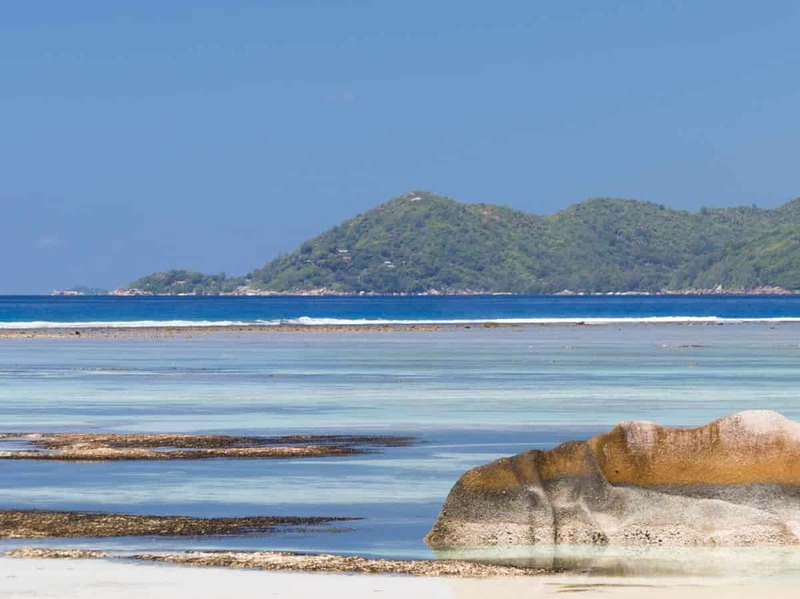 Most liveaboards spend an entire day here, beginning with an early morning immersion spent searching for hammerheads. Afternoon dives are best for spotting schooling fish, reef sharks, marble rays, and the occasional tiger shark. So, photographers should plan for a wide-angle only adventure. This challenging site is the most famous in Cocos for a good reason. You can expect to see thousands of schooling fish and come face to face with more sharks than you can count. Lucky dive groups will encounter hammerheads schooling by the hundreds, especially between July and November. Dirty Rock is also known for encounters with whale sharks, manta rays, and bottlenose dolphins. So, be sure to keep an eye on the open ocean, especially during descent and ascent. If possible, keep your video rolling throughout every dive here. You never know what incredible wildlife will cruise past! Most sites around Cocos are known for encounters with reef sharks and hammerheads. But, the famous residents of this wall dive are Galapagos and silky sharks. Strong currents and challenging surface conditions often make for a difficult entry. But, the big shark action here is worth the extra effort. Cleaning stations and shelter from the open ocean make this a haven for the sharks, who often gather here in large groups. Mantas frequent these waters too, so keep an eye out for their silhouettes as they glide silently above. These twin sites feature some of the most exciting diving in Cocos. And, the two couldn’t be more different. A huge underwater archway dominates the landscape at Dos Amigos Grande. And, because the swim-through creates a strong current, sharks and rays often gather here in large numbers. Nearby, at Dos Amigos Pequeña, the topography changes into a barren slope of volcanic rock. This is one of the best-known spots in the region for up-close encounters with hammerheads thanks to numerous cleaning stations. Both of these areas are home to pelagic sharks, too. So, keep your eyes peeled for tigers and oceanic blacktips! This submerged seamount, located more than a mile offshore, promises Cocos diving at its finest. Divers can expect interactions with Galapagos sharks, silky sharks, whale sharks, and mantas. Plus, hammerhead sightings are nearly guaranteed here during the rainy season. Unlike other sites in the region, dive groups often remain stationary on this slope. Hunkered down in the rocks, you can avoid the powerful current and wait for an incredible variety of megafauna to pass you by. Keep in mind that this site begins at 80ft (24m) so using Nitrox is advised to extend your bottom time.